One of the rising stars of the young British folk scene is Sam Kelly. Shire Folk caught up with the Lost Boy at Folk by the Oak. With Eric Bibb playing in the background we talked talent shows, Ruth Notman and Michael McGoldrick’s payment demands. SF: You’re a busy man, what with The Changing Room, various duos and trios and the Lost Boys as well. How do you manage all of that and what does each different bit give you? SK: It’s a great position to be in. I’m now for the first time getting to the stage when I’m having to turn things down. For the last year, from the Folk Awards thing, having the first full-length album out – more people have been asking me to do things. Because I just love playing music with as many different people as possible I’m always in the mindset of just saying yes to everything. Now I’ve had a few things where I’ve been burning the candle at both ends, so it’s just about being realistic and actually treating it as a career and thinking I do actually need some time off! Although I’ve still got some really exciting things in the pipeline – I made this album with The Company of Players earlier this year and next year I’m working on an album with Ruth Notman, which will be really cool. SF: I haven’t heard of Ruth Notman since her second album, Life of Lilly. SK: She hasn’t done anything – she’s training to be a doctor. I was a huge fan of Ruth’s back when I was 14 or 15, when her first album came out, and I just contacted her out of the blue last year, saying I’m a huge fan, I’m a folk singer, do you fancy meeting up and having a jam and perhaps guesting on one of my songs? I had a really nice chat with her and popped into hers on the way up North and had a jam, really got on well and decided to work on an album together. We’re not sure whether that will be me helping and producing her stuff or whether it will be a duo thing. That’s something I’m really looking forward to, because in my mind it’s depriving the folk scene with her not performing. SK: Nettlebed was one of those places we’ve been trying to get a gig there for a while and eventually managed it. We website didn’t sell many tickets – which for us as a duo is fine. Nettlebed were very apologetic as they usually get more people and they wanted us to have a good gig, but sometimes the really small, intimate gigs can be the most fun. That was one of those – it was an amazing gig. Not ideal for everyone as folk clubs struggle to stay open and keep going as it is, but we had a really fun gig. SF: It’s really important to get not just young performers, but younger people to folk gigs. SK: There definitely is a really good community of young, up and coming people who now are my best friends – all the guys in my band, Kitty website – a great bunch of people. There is that group there and it’s great that festivals like this website give opportunities. This was actually the first festival we ever played in 2013, on the Acorn Stage when it was really small, so it’s so lovely to come back here headlining the Acorn Stage. It’s really cool that Adam website had that much faith in us to put on a good show. SF: It’s difficult to avoid the ‘Britain’s Got Talent Finalist’ tag. What do you think about the fact that it keeps coming up? SK: I guess a lot of people in my positon would be quite reluctant to talk about it, but I actually had a really awesome time doing it. The main thing I got out of it was loads of free clothes! And I got to live in a Hilton in London for a couple of months and had three free carveries every day – it was incredible! I did put on a lot of weight, but it was amazing. As a performer it was a hugely beneficial experience because before I had even really started my career I’d played in probably the most highly pressurised environment you could possible play live in, playing in front of the judges and 4000 people who are so ready to boo at you if it goes wrong, and 13 million people or whatever watching on telly. I’m the sort of personality type who is very positive about everything and with that show I was the perfect personality to be on it because I didn’t care what happened. I don’t actually watch any TV let alone talent shows and things like that, so I was kind of outside of it and enjoying it from an outside perspective. The only thing it caused difficulty with was it made it a hell of a lot more difficult to get gigs – to get gigs as a serious folk musician. I think actually that made us a lot better musicians because when we played here in 2013 it wasn’t so bad because of the nature of the Acorn Stage, we ended up with a huge audience by the end and sold about 50 CDs there. Then later on in the summer at Towersey, they gave us a really good spot. We did this New Roots competition, which is amazing, but I thought it was the only way we were going to get a gig. So we had this amazing spot at Towersey on Friday, just before the Unthanks and after Vin Garbutt, then the compere said ‘Now next we’ve got for you a Britain’s Got Talent finalist!’ You can imagine how that went in a folk crowd. Some of them booed and we walked out on stage to a sea of crossed arms. We were playing as a trio then with Jamie website and Evan website who I went to uni with and it just gave us an extra challenge – we’ve got an audience that is actively against us and we need to win them over to our side. I think that made us a lot better live. SF: BBC Folk Award winner! SK: Yeah. From Britain’s Got Talent finalist to Radio 2 Folk Award winner! So from that point of view that was amazing, just because it makes it easier. SF: I’ve listened to the new album a couple of times and it’s brilliant. It’s got a fantastic version of ‘Bonnie Lass of Fyvie’ – how did you get Cara Dillon and Michael McGoldrick to play and sing on it? SK: It’s a funny story actually. We know Cara and husband Sam well because they were one of the first people in the folk scene to take us under their wing. That same year, when we were completely unknown, we supported Cara for a few gigs. Sam randomly heard of us because we did a few gigs near where they live and the promoter knew Sam, and Sam came to meet us and gave us loads of advice. That was the first experience I had of meeting one of my heroes. Just last week I was playing guitar in Seth Lakeman’s band and I’ve been on tour with John McCusker, I’ve just played in Phil Beer’s band, but then I didn’t know how lovely and supportive everyone was. How people genuinely care about young artists coming through. That first meeting with Sam I didn’t know what to expect at all and he gave me his number and said he’d support us when he can. Everything we’ve released and produced, I’ve had loads of production advice from Sam and Sean Lakeman as well. Another thing I realised when we did the first Changing Room album, when we had John McCusker on it, was how up for collaborating people were. I would never have thought about emailing John McCusker to ask him to play on something. After I realised how lovely everyone is I asked Cara if she’d be interested in duetting this track and she was really up for doing it. It was the same with Mike McGoldrick actually. I first met him at Costa del Folk last year … I have this thing where I’m almost always the last person to go to bed at any festival or session. I had a few amazing evenings playing tunes with Daoiri Farrell, Mike McGoldrick and Mike Harding in a hotel until about 6 o’clock in the morning. I was still at the point where I would never have asked Mike McGoldrick to play on anything because I was very in awe of him, but Toby website knows him really well, has played with him, John McCusker and John Doyle a lot, said why don’t we ask Mike McGoldrick? Next thing I knew Mike McGoldrick had agreed to play on a couple of tracks on the album as long as we gave him a can of Red Stripe and 50p! SF: ‘Shining Ship’ has got a really unusual sound to it – psychedelic and Eastern. SK: One of the great things about the Lost Boys is there are a few really good engineers and producers in the band, so it’s not all on me to think of everything. ‘Shining Ship’ was one of the tracks that Jamie and I arranged from an old Scottish ballad called ‘Demon Lover’. We arranged it quite a while ago, but we ended up not doing it for the first album. We played it a few times, but it fell into the background. It was based around guitar and banjo, simple drum thing, but that was one of the tracks where there was zero road preparation for it when we went into the studio. We started off recording me and Jamie’s banjo live in the booths and built up this whole soundscape around it. There was no thought process – we just let it happen. The beauty of this recording was that we were all in the studio for the whole time. 12 days, all of us. It’s a studio I do some part-time work at, so we could record until 3 or 4 o’clock in the morning and that was when we were at our most creative. It developed in this amazing way and became for most of us our favourite track on the album because it’s one that really captures the process, being creative with different instruments and sounds. It’ll be really interesting to see how we translate it in a live situation. 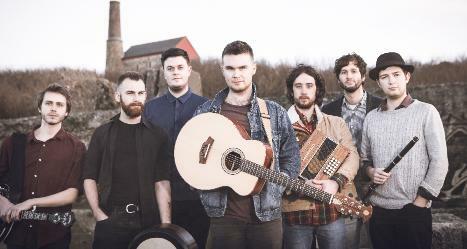 Sam Kelly & The Lost Boys’ latest album Pretty Peggy is released on 6 October on Navigator Records.